Will the new secretary of defense stand up to the hawks and wield the budget axe? Lots of folks felt that when President Obama picked Chuck Hagel as his secretary of defense, it augured well for the president’s second term. That’s because Hagel, a skeptic of war with Iran, a critic of Israel, and seemingly prepared to make significant cuts in defense spending, would be a breath of fresh air at the Department of Defense. But it’s worrying, to say the least, that the pro-military hawk who chairs the House Armed Services Committee, Buck McKeon, has suddenly become a fan of Hagel. Is that because Hagel is slyly deceiving the crusty old war hawk while intending, all along, to move left with Obama on defense? 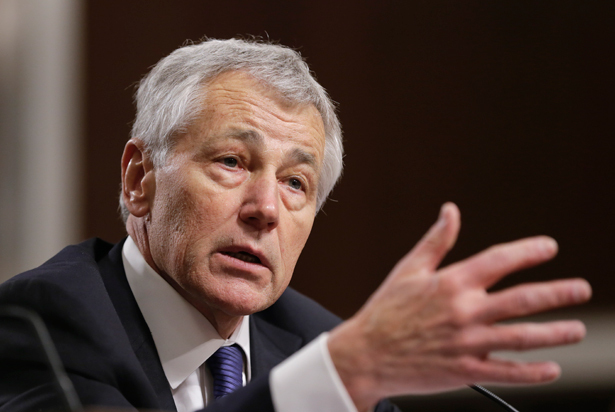 Or is Hagel, and is Obama, caving in to the generals and the military-industrial complex? Perhaps we’ll find out on Wednesday, when Hagel delivers a major speech on defense policy? Mr. McKeon said he has come around on Mr. Hagel, swayed in part by the defense secretary’s announcement that reversed an Obama administration decision that had canceled an expansion of missile defenses. Mr. Hagel instead ordered the Pentagon to spend $1 billion to deploy more interceptors along the Pacific Coast to counter the growing reach of North Korea’s weapons. And Pentagon officials have disclosed that Mr. Hagel’s next foreign trip will open with an alliance-building visit to Israel. “I’m feeling pretty good about where he is heading now,” Mr. McKeon said. The $1 billion missile deployment program in the Pacific, of course, may have been designed chiefly to placate hawks after the Obama administration, seeking favor with Russia, canceled a missile-defense expansion in eastern Europe. The writing seems all over the wall. That review is due in late May, and Gen. Martin Dempsey, chairman of the Joint Chiefs of Staff, is already adjusting the nation’s expectations. “We’ll need to relook at our assumptions, and we’ll need to adjust our ambitions to match our abilities,” Dempsey said during a recent speech at the Center for Strategic and International Studies. The situation has Washington defense analysts in agreement on a couple of things: The military is in the midst of a cyclical downturn in defense spending, and the outlook for navigating it well is grim. Budget pressures at the Pentagon have renewed a debate about the value of the US Navy’s giant aircraft carriers, with critics arguing the warships are fast becoming costly relics in a new era of warfare. With the Pentagon facing $500 billion in cuts over the next decade, a Navy officer has dared to question the most treasured vessels in his service’s fleet, saying the super carriers are increasingly vulnerable to new weapons and too expensive to operate. “After 100 years, the carrier is rapidly approaching the end of its useful strategic life,” wrote Capt. Henry Hendrix in a report published this month by the Center for a New American Security, a Washington think-tank with close ties to President Obama’s administration. Part of the reason for the questioning is that Chinese missiles, which cost almost nothing, could in the future take out an entire aircraft carrier. Meanwhile, the stuff is mind-bogglingly costly. A single aircraft carrier, incredibly, costs $13.6 billion and the task force that operates it costs $6.5 million per day, or $2.4 billion a year! Memo to Chuck Hagel: this stuff is useless, and we can’t afford it anymore. Let’s see what Hagel says this week. Hopefully, at the very least, it will discomfit Representative McKeon. Meanwhile, congressional hawks hate Obama's stance against nuclear proliferation, Robert Dreyfuss writes. Keep up the good work, Mr. President!